The best garage door lubricant for most applications is WD-40 Protective White Lithium Grease. This high performance lubricant is ideal for metal-to-metal applications that require heavy-duty lubrication and protection against rust and corrosion. The convenient permanently attached two position straw allows you to spray precisely where you want. Using the right lubricant will prolong the life of your garage door and opener. One of the most common questions a garage door technician will receive is: "What should I be using to lubricate my garage door?" and the next question usually is: "How often should I lubricate my garage door?". We recommend WD-40 Protective White Lithium Grease and you should lubricate your garage door at least two times per year. If you live in a really hot climate, you might wan't to lubricate your garage door once every three months. This will ensure all hardware on the garage door is moving freely which helps prevent wear and prolongs the life of the components. Most homeowners look for whatever is available in their garage, which is usually a spray can of traditional WD-40. They lubricate their garage door to find out it is only getting louder over time. 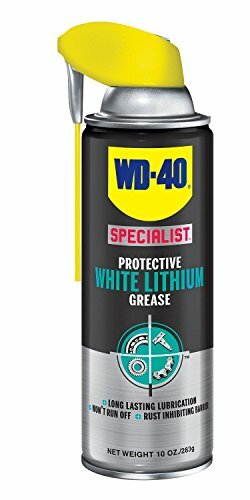 WD-40 Protective White Lithium Grease is different from the traditional WD-40 spray that has been laying around in garages for decades. Let's address this issue and talk about what you should be using to lubricate your garage door. Contrary to popular belief, traditional WD-40 is not a long term lubricant. It is a short term lubricant, cleaner and rust preventative. If you ever get tar on your hands or maybe on your vehicle, you can use traditional WD-40 to remove it. The Crayola Corporation recommends using traditional WD-40 to remove Crayola marks from a variety of surfaces. It works very well for this application and it has many other uses. When used on a garage door, traditional WD-40 will strip the oil from metal components, therefore removing any lubrication. You now end up with metal on metal with no lubricating oil to reduce friction and quiet down the door. This is why the garage door will actually get louder over time after applying traditional WD-40 to all moving parts. Even though we don't recommend using traditional WD-40 to lubricate your garage door, we do recommend using it to clean your garage door tracks. It works well at removing any grease or debris that has built up over time. Brake cleaner works well for this task as well. If you are like most homeowners, you are looking for a garage door lubricant online or at your local home center. The WD-40 Protective White Lithium Grease is a great option because it works well and it can be found almost anywhere at most home centers and online. It is also a great lubricant for many other applications as well. We tested the WD-40 White Lithium Grease, 3-IN-ONE, and Blaster garage door lube in the field. While all lubricants seem to quiet down the garage door, we preferred the WD-40 Protective White Lithium Grease with its built in straw and thick protective coating. The built in straw was handy because it allowed you to use the can two different ways. You could use it with the straw folded down for a more broad spray or you could use it with the straw flipped upwards for a more concentrated spray for harder to reach areas. The built in straw is permanently attached so there is no chance of losing it. Great feature! We chose to compare the three most popular garage door lubricants in this article... WD-40 White Lithium Grease, 3-IN-ONE, and Blaster garage door lube. If we had to recommend one, it would be the WD-40 Protective White Lithium Grease. We found it to be easier to use and it did a better job at lubricating the garage door. They are both available online or at your local home center. 3-IN-ONE and Blaster garage door lube come out of the can at a high rate causing it to drip all over the ground. On the contrary, the WD-40 White Lithium Grease came out as a thick protective coating that sticks to the surface you spray it on. The built in straw on the WD-40 white lithium lube helps direct where you want to apply lubricant and will never get lost due to its permanent attachment. We recommend using WD-40 Protective White Lithium Grease for your garage door needs. Where Should I Lubricate My Garage Door? There are several areas on a garage door that need lubrication a couple times a year. Keeping your door lubricated will help prolong not only your door, but your garage door opener as well. A smooth running, well balanced garage door takes less effort to open and close therefore reducing stress on your automatic opener. Let's take a look at the photo below to determine how to lubricate your garage door. Torsion springs are mounted above your garage door. Lubricating these springs will help reduce friction and noise as the coils rotate when the door opens and closes. There is a metal bearing or plastic bushing inside the torsion spring mounting cone on one end that needs lubrication as well. The plastic bushing will sometimes create a high pitch squeal if it needs lubrication. One squirt of lube will resolve this issue. If you have a pair of torsion springs, try to use the straw on your lube can to squirt some oil in between the mounting cones. This will be harder to do because the bushing is not exposed like on a single spring set up. DO NOT try to disassemble your spring assembly for the sake of lubricating the bearing or bushing. This can be EXTREMELY dangerous. Bearing plates are mounted at the top of your tracks on a torsion spring setup. This is the plate that supports the torsion shaft at both ends of the garage door. They have a large bearing that needs lubrication to keep moving freely. Spray some lubricant where the shaft is coming out and it will work its way into the bearing when you use the garage door. This lubrication point often gets overlooked. The bearing plates are doing most of the work since they carry the full weight of the garage door. The tracks on a garage door do not need lubrication or heavy grease. Lubricating the tracks or applying heavy grease will cause the rollers to slide in the tracks, not roll like they are intended to do. Heavy grease will also collect dirt and dust, therefore making it harder for your garage door to open and close. Use WD-40 and a rag to remove any grease or debris from your garage door tracks. Brake cleaner also works well for this task. The hinges on a garage door are the main pivot points that keep the sections inline as the door goes up and down. They are metal on metal and require lubrication to keep friction and noise to a minimum. A standard 16' x 7' garage door has 15 hinges that need lubrication. When hinges and rollers are lubricated properly your garage door opener will perform better. Garage door rollers vary in material and type. The standard plastic roller that comes with a garage door does not have a lubrication point. Premium nylon or steel ball bearing rollers do have a lubrication point where the stem meets the roller. Lube can be applied at this point to free up the bearings and reduce friction. Click here to learn more about the different types of garage door rollers. The lock on a garage door is a necessity for anyone who doesn't have an automatic opener or if the power goes out. Lubricating the garage door slide lock will make it easier to engage and disengage any frozen parts that might be sticking due to rust and corrosion. If your garage door is equipped with extension springs that are mounted above the tracks on both sides of your door, then you will need to lubricate the pulleys. There should be 4 pulley's total, 2 on each side. These pulleys have ball bearings in the center that will get sticky and cause the door to shake side to side as it is going down. Lubricating the bearings in these pulleys will eliminate this issue. If your home is equipped with a screw drive opener, you will need to lubricate the screw drive mechanism with a low temp grease. This will make it run smoother and quieter. Cut a 45 degree angle on the tip of your tube of grease and skim it along the screw drive rail. A little bit goes a long way. If you apply too much grease to the screw drive rail on your garage door opener, it will glob up when you run the opener and fall on your car or the ground. You will then have a mess on your hands especially if someone tracks it into the home. We see this all too often so remember, a little goes a long way. Skim the underside of the rail so the low temp grease fills into the screw drive grooves. That's all you need. Most chain drive garage door openers are considered to be lubricated for life according to the manufacturer. It doesn't hurt to lubricate the chain or sprocket if you feel compelled to do so. Keep in mind, anything you spray on the chain might drip down on your car or the floor to be tracked into the house. Belt drive openers do not require any lubrication.